Hair loss caused by radiation, whether due to accidental exposure or cancer treatment, is often extensive and irreversible. Understanding how it happens, however, can make it easier to deal with. In some cases, there are ways you can mitigate the damage. It's also helpful to be familiar with some of the odd changes you can expect if your lost hair regrows. Exposure to radiation can damage all the cells in your body. It tends to do most damage to cells that divide frequently, which is why it can be used to treat cancer, as cancers usually grow more quickly than healthy, normal tissue. Unfortunately, hair follicles also contain fast-dividing cells, so they can be permanently damaged by radiation exposure. The noticeable results of radiation exposure on the hair depend on what type of radiation was involved and how long exposure lasted for. Controlled exposure in a hospital yields predictable results which you can discuss with your doctor. Hair Loss begins immediately and shedding may continue for up to two weeks. Your scalp may feel itchy. Scratching is bad for your skin but won't usually worsen hair loss as follicles in itchy areas will already be dying. When radiation exposure occurs accidentally, for instance in a lab accident or because somebody strays into a contaminated area, hair loss is often an early symptom. If it begins suddenly, with hair coming out in clumps, and is accompanied by nausea and weakness, you should seek urgent medical attention. Doctors may advise removing any remaining healthy hair as it will remain radioactive, prolonging exposure and increasing long-term health risks. In a hospital setting, the way that you receive radiation is carefully controlled to reduce damage to healthy tissue. If you have a cancer that is localised in one area of your body (i.e. not a blood cancer or a heavily metastasised cancer), the treatment you are given will be very direct and will only cause local hair loss. This means it may not affect the hair on your head at all. If you need to have radiotherapy on your scalp, keeping very still as directed – even if you feel as if you are getting a painful sunburn – will help to keep the affected area small. You can use an aqueous cream to sooth the burnt area. You may then be able to style your remaining hair to hide the bald patch, or wear a hair patch over it. These can be matched to your hair colour and type and woven into place for easy maintenance – often they're almost invisible. If hair starts to regrow in areas affected by radiation, it often does so when the recovering follicles are still more delicate than usual. Keeping it short at first will reduce the strain on them and help to keep them active in the long term. Wash your hair no more than twice a week, unless your doctor advises otherwise, and use a gentle shampoo. Most people who lose their hair due to radiotherapy experience some hair regrowth within three to six months after the treatment finishes. The new hair, however, may not be the same as it used to be (see our article Why Has My Hair Grown Back Differently After Cancer Treatment?). Often the first hair to return after treatment is soft and downy, like a newborn baby's hair. For some people this is all the hair they can get. It can leave you looking bald from a distance, but it is very soft and many people find it pleasant to stroke, so there is a positive side. Other people find that this hair falls out within a month and is replaced by more normal hair. Post-radiation hair sometimes seems to be a different colour from the hair that went before it. This is because damaged follicles can respond by producing hair shafts of a different thickness which refract light differently. As radiation also damages the network of blood vessels supplying nutrients to follicle, malnutrition can sometimes lead to the production of thin, pale hairs in the early stages of recovery, but these will usually darken over time. Some people find that their hair grows back curly after radiation exposure when it was straight before. This is because a beam of radiation coming in at an angle can damage one side of a follicle more than another, leading to the production of oddly shaped hair. The effect can be odd if just one patch of your hair is affected. For best results, give it six months to recover before using straighteners, as this will minimise extra stress – gel or mousse can control it in the meantime. Hair loss that results from cancer treatment can be emotionally challenging for many people. 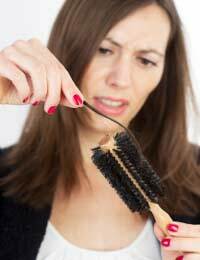 Find out more in our article Cancer And Hair Loss.